With more than forty years of shoemaking experience and an outstanding technical understanding of manufacturing shoes, Mephisto set out to create the new Allrounder collection. Since their first introduction in 2003, Allrounder by Mephisto has combined style and comfort in both women’s and men’s shoes. Just as importantly, Allrounder continues to gain momentum as a comfortable, high-quality brand through their technology and fine materials. Keep reading and find out why Allrounder by Mephisto shoes deserve space in your closet. Allrounder by Mephisto footwear uses the latest in technology and fine materials to create both stylish and comfortable shoes. As a result, all Allrounder shoes are both unique and durable, bursting with originality and distinctive craftsmanship. From advanced cushioning and stability control, Allrounder is a trusted name in comfort footwear and active lifestyle. Allrounder by Mephisto features and unique Soft-Air technology that guarantees a super-soft and tireless walking experience. Their Soft-Air technology minimizes shock from walking, offering protection to your feet, relief for your joints, and proper care of your back. In addition, it helps provide light air cushioning with every step, relieving impact on the knees, hips and lower back, for effortless walking. Their shock-adsorption system help protects various parts of the body from damaging joints and vibrations. Being that, this system significantly reduces the impact on the joints, back and legs from walking on hard surfaces. Allrounder by Mephisto shoes contain a patented Active Suspension system that provides outstanding shock absorption over all sorts of terrain. This system ensures protection for your joints, vertebrae, and spine with each step. Most Allrounder shoes are orthotic friends, being that their removable footbeds easily accommodate most orthotics, arch supports, and shoe insoles. Why buy Allrounder by Mephisto shoes? Allrounder by Mephisto shares the same exact standards Mephisto is legendary for. Allrounder offers both comfort and style while maintaining a high regard for quality. When considering your next pair of Allrounder casual shoes, walking shoes, running shoes or hiking shoes, you can be sure you’ll find quality footwear that complements your active lifestyle. 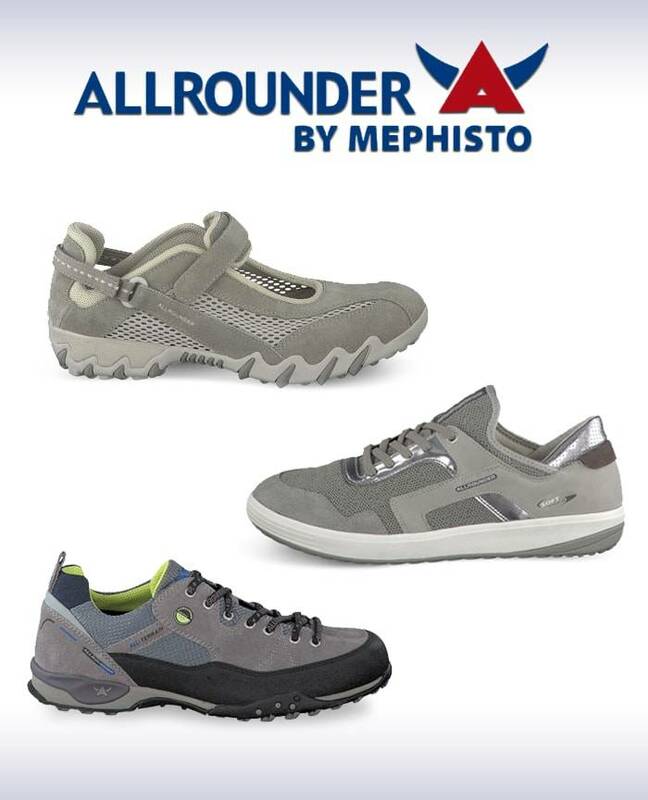 Here at Lucky Feet Shoes, we are proud to carry Allrounder by Mephisto. We invite you to visit any of our shoe stores in Southern California to obtain a free foot analysis and find the best shoes for your needs. Click here to schedule a free foot analysis. Come into any one of our stores, located in Anaheim Hills, Rancho Cucamonga, Riverside, San Dimas, Temecula, La Quinta and Palm Desert! Visit us today and try on a pair of Allrounder by Mephisto shoes! At Lucky Feet Shoes, we carry many Allrounder by Mephisto: Casual Shoes, Walking Shoes, Running Shoes, Hiking Shoes; in any of our Southern California stores. If you are looking for Allrounder by Mephisto footwear in Orange County, the Inland Empire, Los Angeles County, Temecula or Riverside; we have seven stores to serve you! Come and visit us today! If you are looking for Allrounder by Mephisto shoes in Anaheim, Anaheim Hills, Yorba Linda, Brea, Orange, Placentia, Costa Mesa, Santa Ana, Fullerton, Irvine, Villa Park or Tustin; then visit our store in Anaheim Hills for your footwear needs. If you are looking for Allrounder by Mephisto shoes in San Dimas, Glendora, Pomona, Covina, West Covina, La Verne, Azusa, Diamond Bar or Claremont; then visit our store in San Dimas for your footwear needs. If you are looking for Allrounder by Mephisto shoes in Rancho Cucamonga, Ontario, Upland, Fontana, Rialto, Chino, Chino Hills, Mira Loma, Eastvale, Colton or San Bernardino; then visit our store in Rancho Cucamonga for your footwear needs. If you are looking for Allrounder by Mephisto shoes in Riverside, Moreno Valley, Corona, Rubidoux, Loma Linda, Grand Terrace, Redlands or Norco; then visit our store in Riverside for your footwear needs. If you are looking for Allrounder by Mephisto shoes in the Temecula Valley, Murrieta, Fallbrook, Lake Elsinore, Wildomar, Hemet, San Jacinto, Pala, Sun City, Menifee, Canyon Lake, Perris, Bonsall or Anza; then visit our store in Temecula for your footwear needs. If you are looking for Allrounder by Mephisto shoes in Indio, Coachella, Thermal, Vista Santa Rosa, Valerie; then visit our store in La Quinta for your footwear needs. If you are looking forAllrounder by Mephisto shoes in Cathedral City, Thousand Palms, Palm Desert, Palm Springs, Desert Springs, Rancho Mirage or Bermuda Dunes; then visit our store in Palm Desert for your footwear needs.